The quickest way to transform a space or feature in your home is to change the color. Here is a list of five high impact ways to use paint to make fresh design statements while on a tight budget. 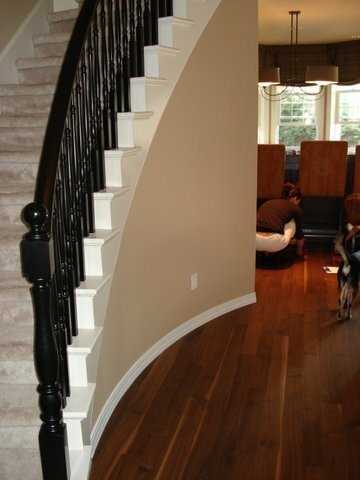 Stair Rail: A few coats of paint to provide contrast can create a dramatic effect on an interior stair rail. 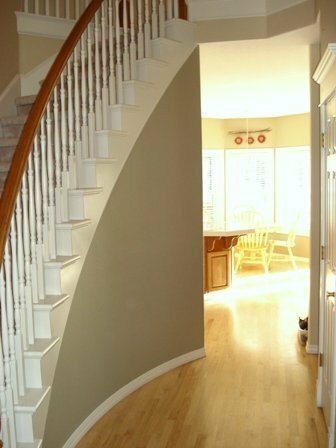 As seen in the photos above, changing the paint on the stair rail immediately renews the feel of the area. Walls: Having a designer help you select new paint colors for your home and then doing the painting yourself is a great way to save money. You get the expertise of the designer, but the labor is free! Molding: Adding a dark color to moldings can help bring a more formal feel to a room without committing to changing the paint within the entire space. Fireplace Bricks: Painting the bricks around your fireplace is a great way to make over an existing focal point in your home. Dark natural bricks can often pull the light out of a room, so brightening them up with a coat of paint can really shift the mood of the environment. Alternatively, adding a dark coat of paint to fireplace bricks can add an air of glamour and sophistication. Cabinet Backs: If your cabinet backs are visible, use them to your advantage. A coat of bright paint that coordinates with your room is an unexpected pop of color that can really help tie a room together. Adding interior lighting will showcase unique items within the cabinets and create a gallery effect in your home. The options are extensive when it comes to using paint to give your home a new look. The best part is that you are capable of making most of these changes on your own. When you do need help or reassurance, a designer should be your first call! At Mosaik Design & Remodeling, we are happy to offer design consultation services for your remodeling project.